Randy Johnson (upper left) greets the group as John Oliver (lower right) from ShopBot tech support looks on. 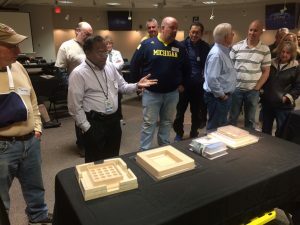 The annual Michigan Camp ShopBot started in 2011 when a new privately-owned makerspace opened in Ann Arbor, MI. So many attended that it was easy to say, let’s do this again. Fast forward to 2016 and the Camp has become a yearly reunion for many, with 50-60 people in attendance. Though attendance was slightly lower this year, one could still feel the camaraderie in the room on Saturday, October 15. The Camp now rotates between Maker Works in Ann Arbor and TechShop Detroit in Allen Park. And like most Camps, some were new to CNC and some were 10+ year converts. 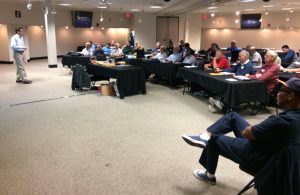 And since we were at TechShop Detroit, there was a great group of TechShop members, too. 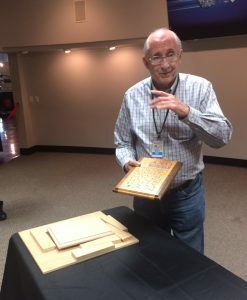 Randy Johnson began the day with an introduction to ShopBot Tools Inc. and defined the CAD to CAM to machining workflow to give everyone a shared vocabulary. Thea Eck then lead several presentations including a new Understanding Nodes and Working with Text presentation. Both included how design (CAD) errors can lead to toolpath (CAM) errors and how to alleviate them. Randy’s Machine Maintenance presentation shined the spotlight on John Oliver from ShopBot’s tech support. John’s presence was a bonus to those troubleshooting their machines or design files. 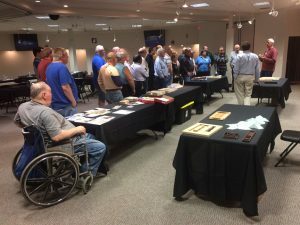 An attendee and TechShop member showing off numerous plaques he created for a friend using a jig design he learned in an Intro to CNC training ShopBot lead at TechShop Detroit in 2014. 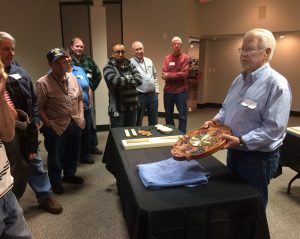 After lunch, attendees took the lead during Show and Tell. There were a few good examples of 3D carving. Randy then continued with a Textures presentation showing the import and trace bitmap commands and a little outside the box thinking to add textures to one’s projects. Thea wrapped up the day with Practices in 3D Carving. Attendees left not only with overloaded brains but they also received PDF copies of the presentations plus a few extra that weren’t covered due to time restraints. The Camp season wraps up in mid-November with the Pittsburgh Camp. This year we traveled to 8 different locations around the U.S. Check our events calendar and also the TalkShopBot forum’s training/camps thread for Camp updates and announcements. 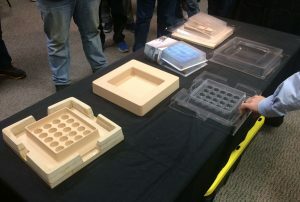 Another TechShop member discusses his machining process to create his wife’s new product. The high density foam pieces are used as molds for vacuum formed packaging. Great example of 3D carved clock.